The new Audi TT also demonstrates its innovativeness in the Hi-Fi arena. The Bang & Olufsen Sound System in the coupe uses innovative Symphoria technology for a fascinating audio experience. 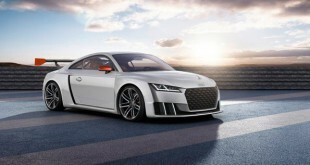 The Bang & Olufsen Sound System with Symphoria is used in the top-of-the-line version of the new Audi TT. A processor analyzes intrusive cabin noise detected by a microphone to optimize the sound image. When combined with MMI navigation plus, sound is also output in 5.1 surround format. With 680 watts of power, the amplifier controls twelve speakers, including two center speakers and two encapsulated bass boxes in the doors. The sound system is visually accentuated by the strip of anodized aluminum bearing the logo of the Danish Hi‑Fi specialists that runs along the edge of the woofer. White LED light emanates from a narrow LED light guide. With this system, Audi has once again substantially enhanced the premium audio experience. In collaboration with the Fraunhofer Institute for Integrated Circuits in Erlangen, the automaker developed the Symphoria software for the post-processing and rendering of audio signals. In the first step, the program separates the individual sound components within the audio signal with the help of a semantic analysis process. It then distributes the separated audio objects inside the interior of the car. The sound image becomes wider and deeper, conveying an entirely new spatial impression. Each passenger enjoys a top-quality, extremely precise audio experience. Audi has already been setting benchmarks for automotive sound systems for years now. High‑end audio with the Bang & Olufsen Advanced Sound System premiered in the Audi A8 in 2005. In 2012, premium sound from the Danish hi‑fi specialists found its into way to the compact class in the third-generation Audi A3. With Symphoria, the brand with the four rings is now taking a large step in the direction of 3D sound, a technology that Audi first presented at the Consumer Electronics Show (CES) in Las Vegas in early 2013. 3D sound enables the listener to also experience the spatial height as a third dimension – the next development step on the way to the audio experience of the future.